Over the years I have driven over the hills that lie between Astoria and Clatskanie many times, and every time I am struck by the region's beauty, and also by its sad neglect. 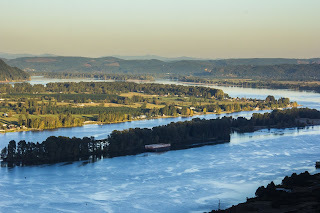 Once upon a time the Southern shore of the Lower Columbia River was a tourism destination, but for some time now it has been unfortunately forgotten. 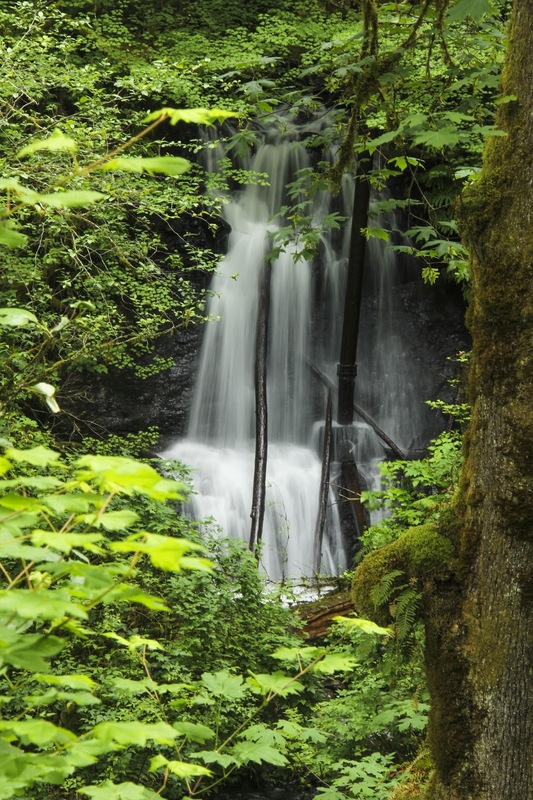 Casual travelers seldom guess at the hidden beauty that can be found here - at the waterfalls that tumble through hidden glens, the quiet valleys, or the rugged ridges ripe for exploration. At the moment this obscurity is for the best - most of the falls lie on private property, and public access is tolerated only due to their lack of use & the respect shown by visitors. Where public land is found, few trails allow for easy or pleasant walking due to the intense logging that dominates both state and private land here. 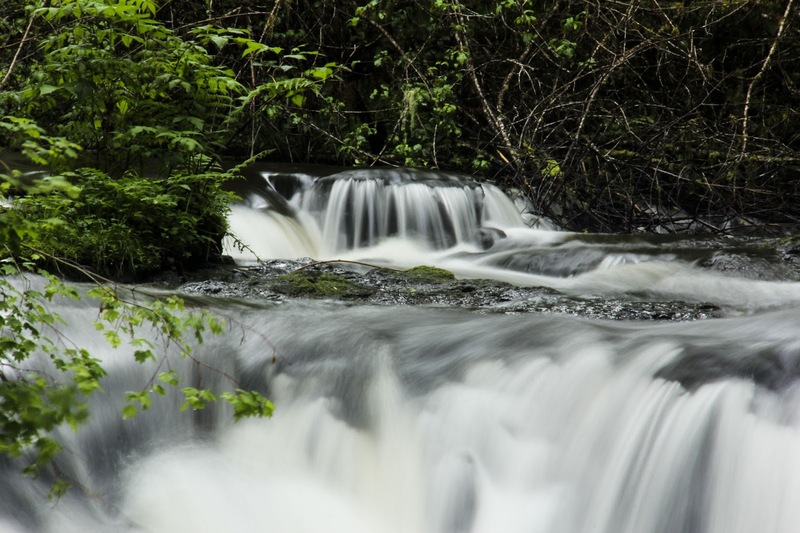 The one place where feet might be stretched on quiet woodland paths is at the Gnat Creek Fish Hatchery, located in Clatsop State Forest. However, the most spectacular portion of the creek where the best falls are located, is sadly not within the public domain. I propose a change to this state of affairs - the creation of a new state park rich with potential for new trails. Once restored, and with time this would be just the refuge endangered species such as the spotted owl and the marbled murrelet need to boost their recovery. Nearby communities would benefit from the commerce brought by increased numbers of adventure seekers - a sustainable source of economic gain. #1. Gnat Creek State Park - 3,000 acres. 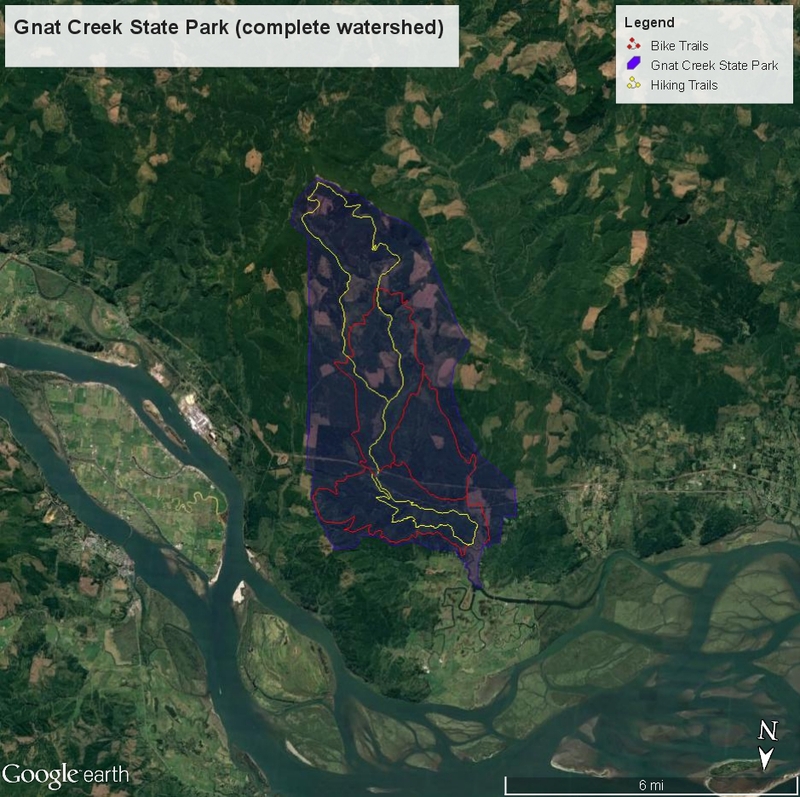 At a minimum, the park should include the main course of Gnat Creek from the swamp near its headwaters and upper falls to its estuary. This would allow for the preservation and restoration of the forest land most necessary to the health of the creek, as well as the area with the most potential for new trails. I would suggest a single lower trail from the hatchery to the estuary, and 2 trails along the upper portion: a continuation of the existing Upper Gnat Creek Trail that would end at the uppermost falls, and a loop trail that would run high above the creek, circle the swamp, and return via the other side of the valley. The valley bottom trail would be designated for foot traffic only, while the upper trail would be open to mountain bikes. #2. 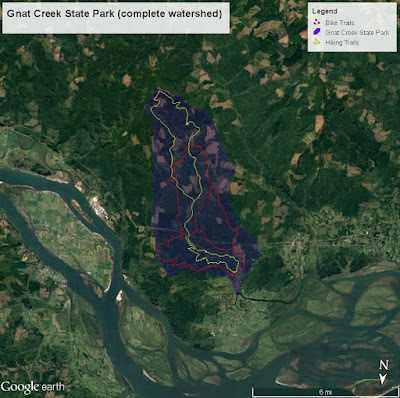 Gnat Creek State Park (complete watershed) - 13,700 acres. This much larger area would protect the entire Gnat Creek Watershed, and in doing so open up many more recreational opportunities. The Gnat Creek trail could be extended to the top of Nikolai Mountain to loop around back to Gnat Creek, and the bike loop could be enlarged beyond the limits of the smaller proposed area. 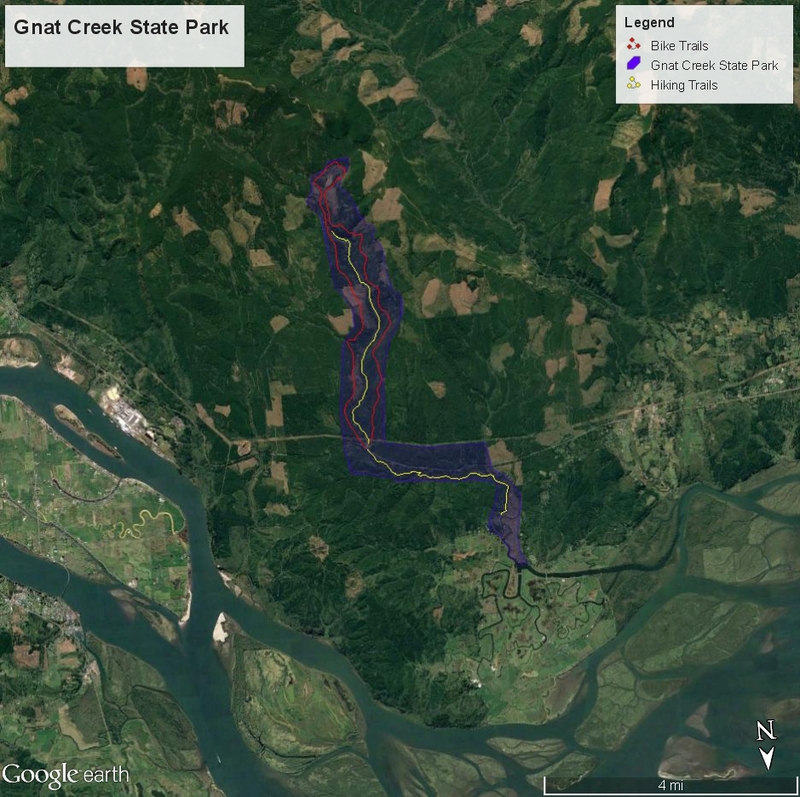 Additional trails could be constructed along the various tributaries of Gnat Creek, and along the ridge North of Gnat Creek’s lower stretch. Perhaps this one is an impossible dream, but while we’re dreaming, why not dream big? 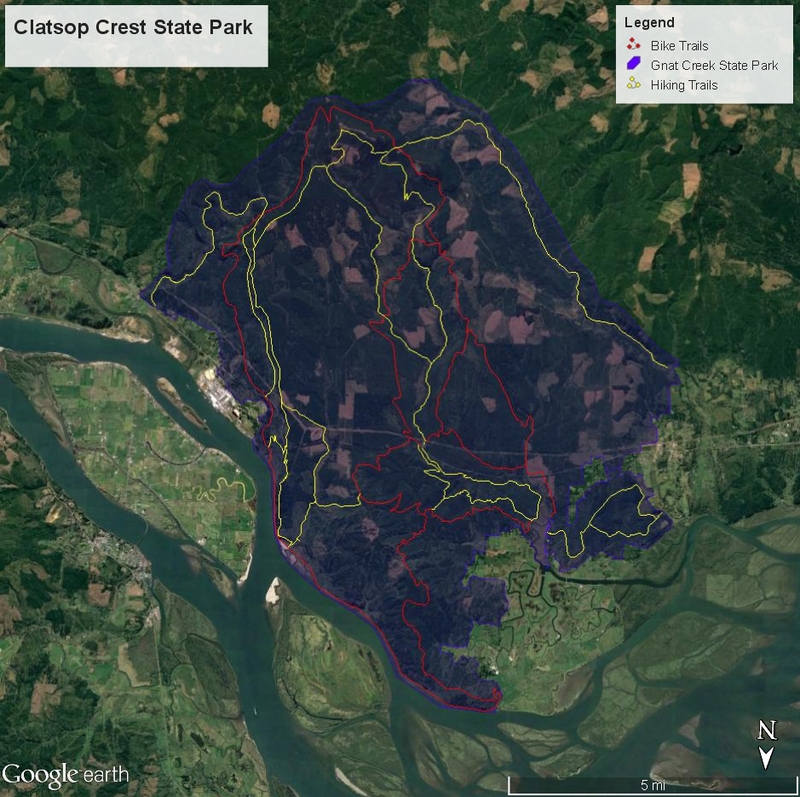 This proposal would encompass the entirety of the Clatsop Crest, and could potentially host dozens of miles of trails in an ecosystem that, once restored, would be a haven amidst the sea of clearcuts that blanket the peaks of the Northern Oregon Coast Range. 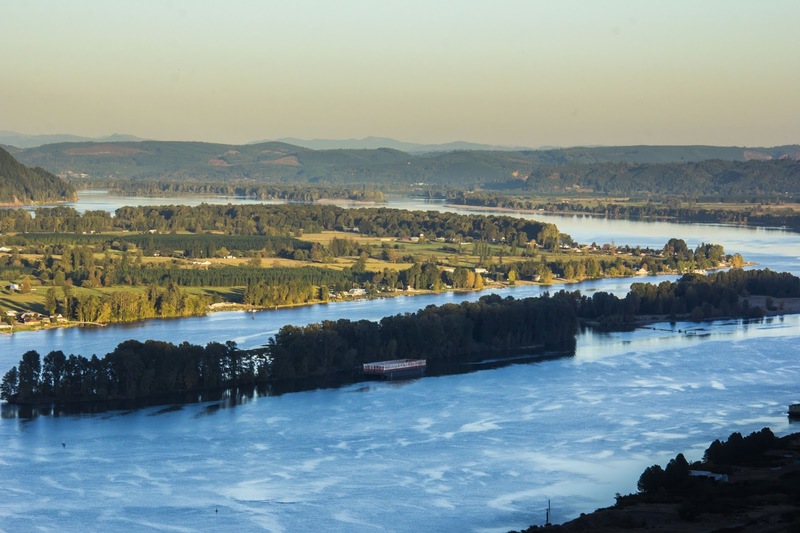 This park would include a large portion of the Columbia River’s shoreline - with an abandoned railroad running along it - a perfect rail-to-trail opportunity! A trail running along the top of the cliffs of the Clatsop Crest would be one of the most spectacular paths in the North Coast Mountains region.